Before you can use twitter for business, it will help to fully understand what twitter is, why people use it, and how it can most effectively be used. You already know it is one of the most popular social media platforms. It is considered what is called micro-blogging. Micro-blogging refers to writing very short posts, in this case 140 characters or less, including links, spaces, punctuation. Even though you don’t get a lot of space, you can do a lot with those 140 characters, we will discuss that a little later on. Why People Use Twitter for Business? The great thing about twitter is that every post can be seen by anyone in the world. Once you press submit it will be live for anyone to see, you can share links to your website, pictures of your products, etc. As soon as you post, anyone following you will see the post (assuming they are online) and they can respond in real time as well. It’s a great way to start talking to anyone when you have a few minutes and want to connect. As a follower it is great because you see who is active right at the time you are signing in, or visiting Twitter. You can immediately send replies and have a conversation. Anyone can have an account and with 500 million people it is hard not to find someone you would be interested in following, or people who would be interested in following you. There are celebrities (they don’t always respond), industry leaders or authority figures, politicians, authors, just like anyone can have a website, they can be on Twitter. When you add a # to a keyword, and make a post, it will automatically link to all other posts on twitter with the same hashtag(and keyword). Anyone on twitter can then click that link and see what everyone is talking about. This is very common with television shows. On TV– If you are watching a show and you see a hashtag come up on the screen, it means that people are using that right NOW to talk about the show. That means you can connect with thousands of people all over the world just by using that same hashtag in your tweet(what a post is called). If you are going to use it to participate in a conversations, I suggest using TweetChat, where you can put in the hashtag and it will show all of the tweets with that hashtag, it is pretty useful, because following along on twitter with all of the posts running together, or via their search results can be time consuming. While I am using TV shows as an example here, companies online use hashtags for twitter parties or chats, or to track conversation about a product, service, etc. Hashtags are used to make tweeting and finding related conversations easier for everyone. When I post something about with the hashtag #socialmedia, you can click on the link in twitter and see a bunch of tweets about social media. Hashtags also save space, because you shorten words and put them together to make one hashtag. To use a hashtag, you can just pick one that you want to use, be careful though to make sure no one else is using it for something you don’t want to be associated with. So, hashtags save space, make linking easier, make it easier to stay on topic in a conversation, etc. If you are talking about a friend or someone else active on Twitter you can use the @ symbol that will automatically link anyone who sees the post, to the person’s Twitter profile. This is great as it brings more awareness to them, and can help them get more followers. It works for you as well, and you can ask people to mention you. This is nice if you want to share a link of theirs, or simply tell more people about them, or make a public message to them. For instance, if you see a post of theirs, and click reply, Twitter will automatically mention them so that it shows on their account, and they can see it singled out from the thousands of posts already on twitter. It seems like everyone shares links, links to a funny website, a joke, a youtube video, etc. If you’ve noticed though, links can take up a lot of space (character wise) so to help with this, companies like Bit.ly have come along and provide link shortening that just about anyone can use. 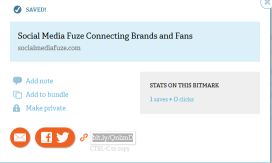 Simply go to bit.ly paste the link you want to share, it will give you a shorter link. The benefit to using a program like Bit.ly is that it will also track the clicks, letting you know how many people went to see what you posted. On Twitter itself you don’t usually need a program like Bit.ly but if you are using one of several tools out there that don’t automatically shorten for you, you might want to, but remember no one will be keeping track of how many visit your link. Up to this point we’ve cover Microblogging, Hashtags, Mentions and Shortening Links, you probably have a good idea of what is involved in posting a tweet, so let’s discuss setting up your account now. When you visit Twitter.com to sign up for your account it will ask for your Full Name. Even as a business, you want to use your real name. Social media is about relationships and people want to build relationships with the person behind the company name. Sign up as yourself, but when you go to choose a username, feel free to pick something catchy that refers to your business. Twitter will help you choose a username based on what is available in their system, you can change your username later if you want to, so don’t worry too much when picking a name, but try to stick with professional, business related. You will have the opportunity to fill in a Bio area, and to choose a profile image. Your profile image should be of YOU, not your company logo. Make it a professional, or at least acceptable photo. Now that your Twitter profile is set up, you can take a break, tomorrow I will follow up with adding a custom background, finding people to follow, getting followers, and what to tweet (when, etc). If you’ve found this to be useful, please share, post suggestions below, ask questions below. Thank you for reading! ← Social Media for Small Business 101 Part 1 What Is Social Media? A most helpful post about a subject(twitter) that we either aren’t using at all, or are not using it too it’s full potential. Thank you Robert, I’m glad you’ve found it helpful, there is so much you can do with Twitter, I think you’ll like my follow up posts.